Studio Cadena’s ultra-bright holiday sculpture in Flatiron Plaza made its debut during New York’s first snowfall of the season. Though it was officially unveiled last night, Happy was set up late last week and photography captured the flurry of moments when it was first discovered by the public. Happy is the winner of the fifth annual Flatiron Public Plaza Holiday Competition, a partnership between the New York Department of Transportation Art, Van Alen Institute, and the Flatiron/23rd Street Partnership Business Improvement District. Its installation signals the start of programming for BID’s “23 Days of Flatiron Cheer.” The project was created by Studio Cadena, a Brooklyn-based firm that was chosen out of seven other invited design teams. 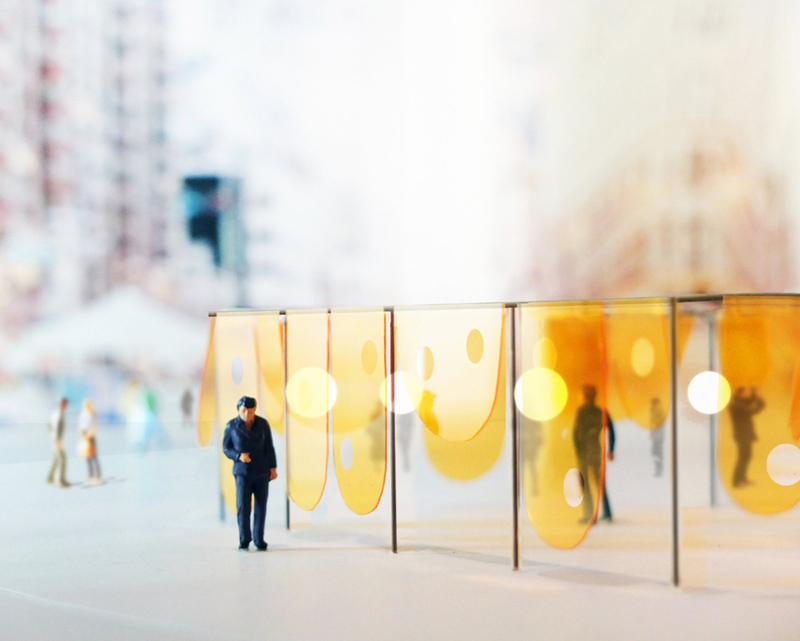 Their winning proposal features a series of translucent yellow screens draped from an open frame that are meant to add a spark of joy to everyone who passes by. It also doubles as a filter for people to see the city in a different light, according to Benjamin Cadena, Studio Cadena’s founder and principal. David van der Leer, exiting director of Van Alen Institute, noted the impact that Happy could have on people's’ daily lives during a cold and colorless time of year. “By expressing a positive emotion in a public space, Studio Cadena’s delightful installation invites people to take a moment to consider the joy of being in the big, busy city during the holiday season.” Happy was selected by a jury of experts in design and public art including the Corcoran Group’s Nick Athanail, Michael Bierut, partner at Pentagram, Emily Colasacco, event director of NYC Summer Streets, as well as V. Mitch McEwan, partner at A(n) Office, and Aleksey Lukyanov-Cherny of SITU Studio. The installation will be on view through January 1, 2019. 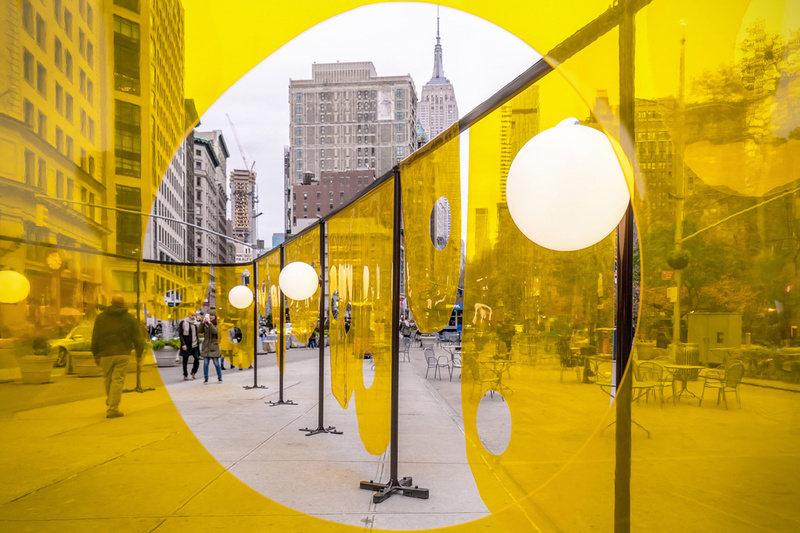 A shimmering yellow sculpture will pop against Manhattan's Flatiron building as its backdrop this holiday season, courtesy of Studio Cadena. As winners of the fifth annual Flatiron Public Plaza Holiday Design competition, Happy will be on display for visitors to enjoy in the North Flatiron Public Plaza starting November 19th. According to the architects, this temporary project is a “warm embrace” for the city in the colder winter months and is meant to make people smile. “Happy is both a figure and a place,” writes Studio Cadena. “In our otherwise bleak social and political context, this architectural installation aspires to carve a small yet more positive urban space.” Happy is shaped by 24 transparent vinyl screens hung from an open frame. Throughout the day it’s set to shimmer and reflect the light in the surrounding neighborhood. Towards the end of the day, it’s designed to cast colored shadows on the plaza sidewalk. Studio Cadena’s design was one of seven other finalists chosen to submit proposals for an invite-only competition. Hosted each year by the Van Alen Institute and Flatiron/23rd Street Partnership, the projects are aimed to spread cheer and enliven the plaza. Other finalists include Agency—Agency, Brandt : Haferd, MODU, N H M D, Office III, P.R.O., and Wolfgang & Hite. Last year’s winner, Future Expansion, designed a semi-enclosure of metal tubes resembling a public pipe organ. Find out why these surfaces are architects' and designers' go-tos for the ceilings, the floors, and everything in-between. We work with a range of products based on the project and client needs, but we like Corian for interior surfaces because it is adaptable, durable, and easy to clean. Corian can also be easily repaired and is stain-resistant, which is why we chose it for the integrated sink and countertop in the pantry as well as the walls, floors, and cabinetry in the restrooms of our newly completed office in East Hampton, New York. We often use ApplePly from States Industries for casework, paneling, and custom furniture. I love that the material is humble, yet can be finished in a way that elevates it to a level of refinement, all the while revealing the nature of how it is made. The workstations and much of the furniture in our studio are made from ApplePly, and we did a great collection of furniture for the Ballard Library in Seattle. We also recently completed the first of many cafes for Blue Bottle Coffee here in San Francisco, and the millwork and display shelving makes extensive use of the material. I would have to say white paint—either a bright white like Benjamin Moore’s Super White or a slightly warmer toned white like Benjamin Moore’s Dove White. For me, white helps tie the room together while diffusing light into darker corners of a space. It also focuses attention into what occupies the room rather than the walls themselves—it makes other colors and materials really come alive. We love to use Bendheim specialty glass in our kitchens. This material is durable and adds depth, texture, and glamour to our modern kitchens. We backlight all of our cabinets to highlight the gold mesh sandwiched between the glass and provide a nice glow and ambiance. 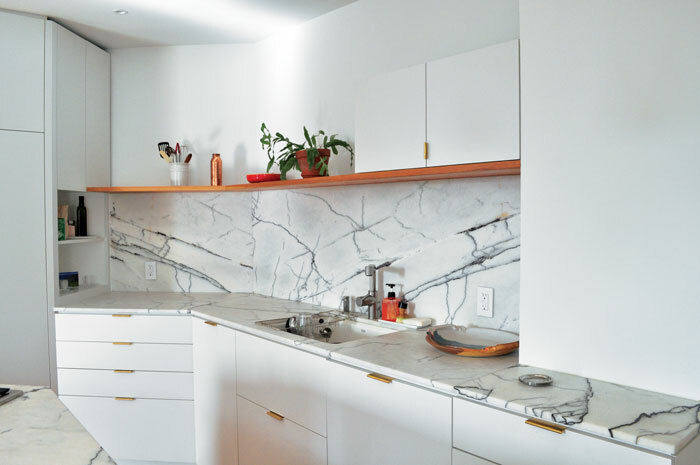 I love using marble for walls, kitchen and bathroom surfaces, and furniture. Texture enhances any surface and utilizing natural stone with a marbling pattern creates dimension and depth, adding a layer of richness to a space. Ann Sacks is a favorite for marble tiles; ABC Stone in New York and Marble Unlimited in California are my go-to sources for marble slabs. Twenty Five young American architects are taking on current significant issues facing the world in the 5x5 Participatory Provocations show at the University of Illinois at Urbana Champaign. With the aim of engaging with the public while still being provocative within the field of architecture, 5x5 argues for participatory criticism, or critical engagement through architectural practice. The curators posed five prompts for offices to explore one of through physical models. The prompts include; Droneports – contemplating the future of drone deliveries, Inve$tment Tower$ – the consequence of the construction of extreme luxury high-rises as financial investments, Lunar Resort – luxury tourism on the moon, NSA Community Branch – the fictional development of NSA community branches, and Trump Wall – the potential construction of an anti-immigration wall on the border between the United States and Mexico. The 25 offices participating are: Abruzzo Bodziak Architects Andrew Kovacs / Archive of Affinities Anthony Titus Studio Brillhart Architecture Carl Lostritto Club Club David Emmons Formlessfinder Future Expansion GELPI Projects is-office JKurtz KNE studio Kyle May, Architect Michael Abrahamson Norden Design Platform for Architecture + Research Path + Price Studio P.R.O. + Quarra Stone Company Sean Gaffney / Christina Nguyen Snarkitecture SOFTlab SPACECUTTER Studio Cadena Ultramoderne The resulting models range from the playful to the austere, while questioning the current status of their prompted issue. 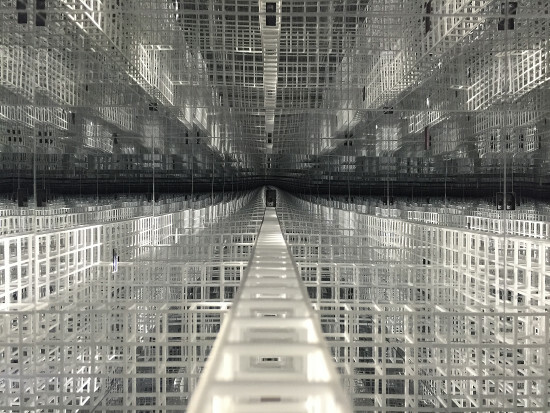 Abruzzo Bodziak Architects’s NSA Community Branch invites guests to "spy" on the model through cellphone peepholes, the interior revealing and endless web of space. PATH + Price Studio’s take on the same subject places an obtrusive metal building over a neighborhood intersection. Below the ground of the model, the building is revealed to be iceberg-like, with massive underground information storage space. Brillhart Architecure’s Droneport model visualizes the very airspace companies like Amazon are fighting for as product delivery systems are rethought. Projects working with the Inve$tment Tower$ prompt also take to the air with slender supertowers. Both SPACECUTTER’s and P.R.O.’s Inve$tment Tower$ step over the cities below them with thin legs, physically expressing the separation of the rich from the rest of the city. 5x5 Participatory Provocations is curated by Julia van den Hout, founder of Original Copy, and co-founder and Editor of CLOG, Kevin Erickson a New York–based designer, and an Associate Professor in the School of Architecture, and Kyle May a New York-based architect and co-founder and Editor-in-Chief of CLOG. Sponsored by the University of Illinois at Urbana Champaign, 5x5 Participatory Provocations will be open through March, 4th 2016. New Practices New York, a distinguished competition that’s part of the AIA New York chapter, announced the six winners of its 2016 biennial competition on January 28. To qualify, the practices had to be located within New York City and founded since 2006; the competition was open to multidisciplinary firms, widening the talent pool. The winners are MODU, SCHAUM/SHIEH, stpmj, Studio Cadena, Taller KEN, and Young Projects. The panel of jurors selected the winners from 53 entries, the members are William Menking, AN’s editor-in-chief, Julian Rose, principal of Formlessfinder, Jane Smith, partner at Spacesmith, Martino Stierli, Philip Johnson chief curator of architecture and design at MoMA, and Ada Tolla, partner at LOT-EK. This year’s theme was Prospect and the jury evaluated the firms based on their ability to leverage multiple aspects of their projects and practices and the architecture profession as a whole. 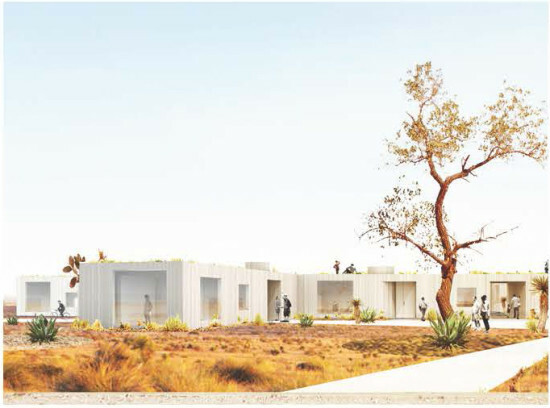 The firms will receive a stipend for an installation and exhibition at the Center for Architecture, which will open May 12, 2016, and will participate in symposia and lectures at the Cosentino Showroom, as well as travel to Spain with underwriter Cosentino. About the winners: MODU Codirected by Phu Hoang and Rachely Rotem, MODU is an interdisciplinary firm that focuses on directing people to their environments. The practice has won numerous awards and was given a commendation for “21 for 21” an award that recognizes “the next generation of architects for the 21st Century.” SCHAUM/SHIEH Founders Rosalyn Shieh and Troy Schaum established their firm in 2009 with an emphasis on the city at the scale of a building and the dialogue between projects and urban plans. They operate between Houston and New York City. 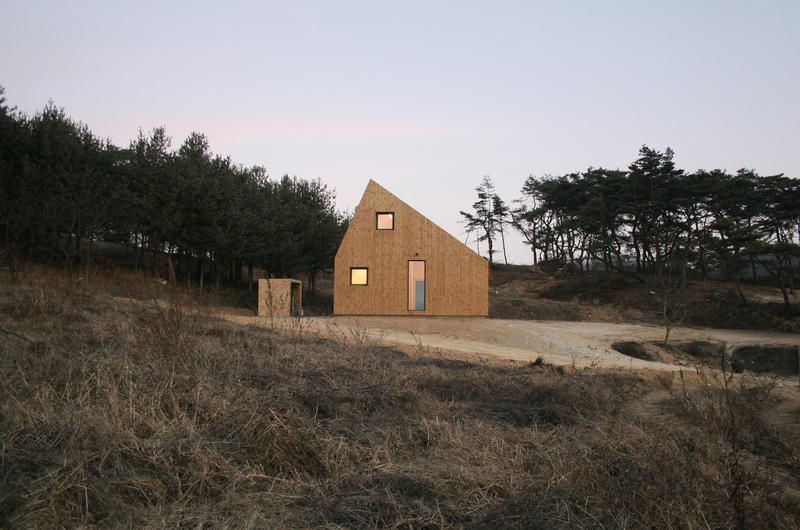 stpmj Based in New York and Seoul, Seung Teak Lee and Mi Jung Lim founded their firm to explore new perspectives on material and structure with regard to our current social, cultural, environmental and economic fabric. Studio Cadena Benjamin Cadena founded his eponymous studio in Brooklyn; projects range from city planning and commercial projects to exhibitions, houses, and furniture. Taller KEN Part of the design team for the Whitney Museum of American Art, Gregory Melitonov and Ines Guzman founded their studio in 2013. The New York– and Guatemala-based firm’s work includes mixed-use development, residential projects, and installation design. Young Projects Bryan Young founded multidisciplinary design studio Young Projects in 2010 and projects include a retreat in the Dominican Republic, a townhouse in Williamsburg, and a Hamptons bungalow. The firm received the Architectural League Prize in 2013. The New Practices New York 2016 exhibition will be on view at the Center for Architecture, 536 LaGuardia Place, New York City from May 12, 2016.